Garage Carpet installati­ons and Garage Door insulation installati­ons. - superior quality (unlike Polypropylene carpets). By installing the garage carpet, draught stopper and garage door insulation, you will benefit from a dryer, warmer and quieter garage space, and also reduce the energy bills. Note : You must have a sectional garage door to install this product. BEST PRICE, QUALITY PRODUCTS and PROFESSIONAL installation service. Exceptional service, highly recommended. Prompt, professional, flexible, good behavior. Goes out of the way to help his customers. Bill just carpeted our large double garage. We were very impressed by his communication from quote to completion. His workmanship and attention to detail is top notch. Offered to carpet a couple of areas I had not considered and the result has come out looking fantastic. Highly trust worthy,very affordable and I recommend his service to anyone considering getting this done! We just had our garage carpeted by Bill, it looks fantastic and what a great job. Highly recommended, top service, well priced and quality product. Cheers Bill. Bill recently carpetted our double garage following a referral from our neighbour who has done the same thing. Bill has done a really professional job at a really good price. I found him to be a friendly and reliable tradeperson and delivered on what I expected. 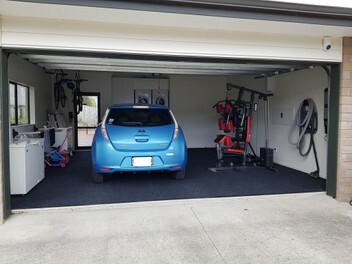 If you want to put carpet in your garage in Wellington, Bill is definitely the man for the job, totally recommend him! Bill: Thanks you so much for an awesome feedback. We really appreciate your business. We just had garage carpeted installed in the laundry end of the garage and we are so pleased. It looks fantastic and was very reasonably priced I highly recommend Bill - the whole process was easy and straightforward Thank you! Bill: Thanks alot for an awesome feedback. We really appreciate your business. Bill recently laid the garage carpet for my double garage. The quality of both the product and his job are fantastic. It absolutely transformed the space. I highly recommend him. Bill: Thanks for supporting a Wellington business. 5 star job!!! Highly recommended. Great Job Bill. Thanks for accomodating the bad weather and changing times around. A great job. The whole deal exceeded our expectations. Bill arrived on time and was a pleasure to deal with.He went the extra mile to ensure everything was right. Would highly recommend him to supply a quality product,service and price. Great service, very happy with the new space this has created to our home. Bill: Thanks for the awesome feedback. We really appreciate your business. Thank you once again. Very pleased with the job Bill did on my garage carpet- his communication was excellent, he arrived on time, and went the extra mile to do a great job- around some tricky corners, into alcoves. It has really transformed the room. Thanks Bill! Bill: Thanks for the awesome feedback. We work hard to meet the expectations of all our valued customers, and really appreciate your business. Thank you once again. What everyone else has said. Bill was prompt, and professional. Did a great job laying the carpet, even offered to use stronger glue at no extra cost and threw in a draught stopper for free. Brilliant, affordable service. Would highly recommend. Thanks Bill.